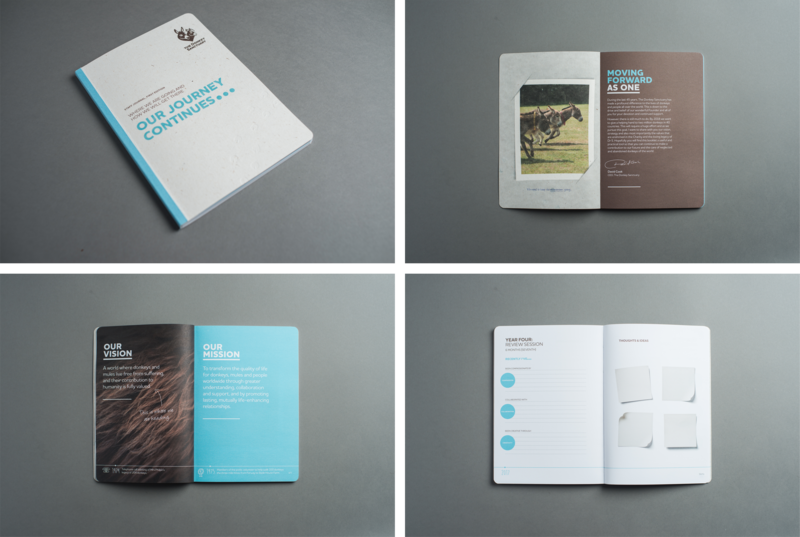 With the focus on the values and ethics of companies so prevalent in the press it seems an apt time to share our most recent work for The Donkey Sanctuary. This client exemplifies the power of a set caring and consistent beliefs to drive the positive impact and growth of an organisation. The publication below is the outcome of a strategic review by The Donkey Sanctuary which looked at their plans and ambition for the next 5 years. They approached the Allotment to develop the words from this plan into a document which would be used as a support to internal communications and values engagement. Through this notebook their sincere values of Compassion, Collaboration and Creativity have been bought to life in away that connects the past, with today and tomorrow. The timeline that runs throughout the book, starting in 1969 when the late Dr Svendsen (Dr S) purchased her first two donkeys, leads the reader to the future and the big goals the charity has to transform the quality of life for donkeys, mules and people worldwide. "It makes me proud to be a part of it all and I particularly like the way it is interwoven with the presence of Dr S – this will really mean a lot to many of us who knew her and sustains the importance of her vision and a feeling she is still involved." The book also focuses on making the link between values (a set of emotional rules that people follow to help make the right decisions in life) and their behaviour by making the notebook an important part of each employees personal development review. At the recent CharityComms conference on the value of values where we co-presented a workshop, Mark Cross at the Donkey Sanctuary said, "The strength and robustness of our brand work has given us the platform from which to develop a vision led corporate strategy that is fully aligned with our brand promise and cuts through our entire organisation. This is an ambitious declaration to internal and external audiences and provides the metrics by which all our teams can be measured." The booklet, which will be supported by other communication touch points, has already made an impact and the response has been overwhemingly positive.